We were about half way through the expedition and it had been another long day, with a new personal best of 37kms covered. We had made up a great deal of lost time the last couple of days, and were told we could actually afford a rest day tomorrow to relax and recover which would be nice. Yeah, unfortunately the expedition was not quite the picture painted above. 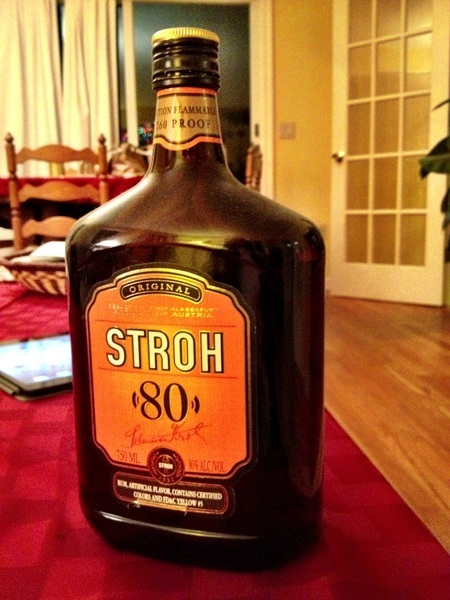 Although, there may not have been port but there was a cheeky bottle of Stroh rum on the journey, and at 80% alcohol it definitely made a fire! …in your stomach. …and by fire I mean nuclear bomb. It was tough, but at least for me I would also say fun. So many bad weather days meant we had to push pretty hard too, with the distance each day longer than the last. Something I have to say we were all quite proud of given the rigorous pace required. To achieve this though we had to make the most of our time, and key to this was getting a routine in place – for making camp, breaking camp, movements during the day, and our own personal routines. But practice makes perfect, and after a few days we were a well-oiled machine and quite efficient in getting things done. 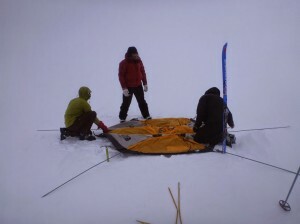 What I want to do in this post and the next is share with you a bit of a day in the life of crossing Greenland. 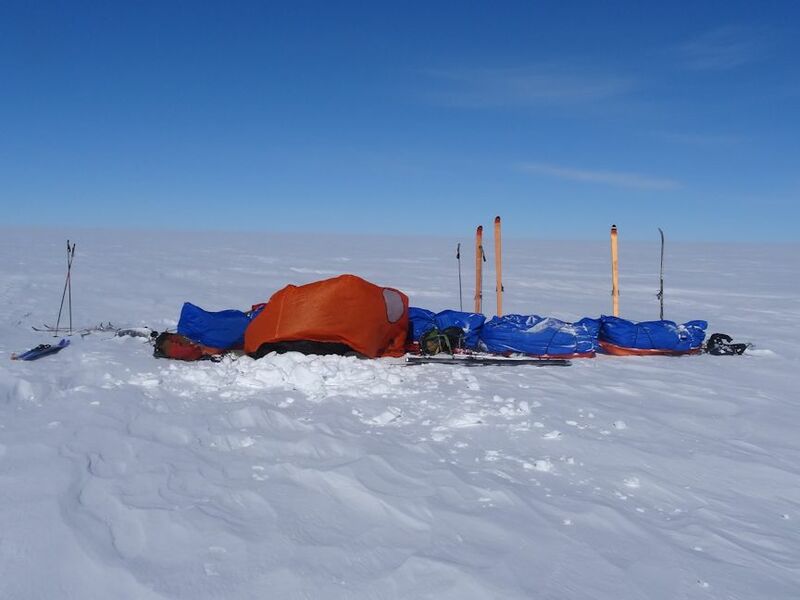 What the general routine was, my personal routine, some key points of camp life on the ice sheet and share some of the ‘haps’ and ‘mishaps’ along the way. I do not want to drown you in one post though so I will split it across a couple. Every day started at 06:30 with a loud 'good morning!' from everyone in each tent, which was kind of cool. As I have said to people in the past: always start with a smile 🙂 No luxuries like being able to snooze for 5mins, stretch or 'wake up' though. Straight off the mark it was go time to not waste time. 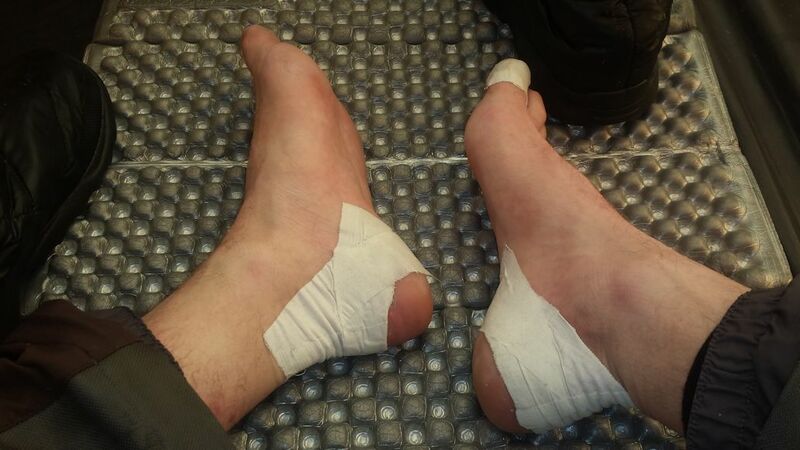 The first thing I did religiously after extricated myself from my oh so lovely and warm Rab 1200 expedition sleeping bag – yes, bit of cheeky product placement, although the link goes to the updated model – was to put moisturiser and Gehwol Extra cream on my feet and tape them up straight away (more on that later). Then, by the time I was dressed, had my tent bag packed and Therm-a-Rest rolled up fresh water was usually boiled and the call for breakfast made. Breakfast… Anyone who knows me knows I am a cereal fiend and breakfast is my FAAAAAVOURITE meal of the day. Slightly different menu on this journey but after a cold night and waking up empty you were chomping at the bit for some food. Anything to kick-start the metabolism and start generating good body heat. The main meal for breakfast for me was a bowl of oats, some muesli, big slabs of butter, some cocoa on occasion, three big spoons of full fat milk powder and 13 sugar cubes. Add hot water and hey presto! Nom nom nom… Oh it tasted goooood! The butter sitting on the top slowly melting away, the odd sugar cube which hadn't completely dissolved to crunch on, and the milk powder forming up into soft gooey balls. Seriously, it was divine. On top of this we would all be munching away on cheese, biscuits, chocolate, anything we could get our hands on really to fill the tank. Once breakfast was over we would finish any final packing, break down the tents and clip on our skis and harness ready to go. The routine each day was travelling for 1.5hrs followed by a short break of around 10-15mins. The only variable to this was 30-45mins for lunch. If the weather or wind was particularly nasty we would dig a small pit behind a couple of the pulkas to put our feet into and hunker down under the emergency tarp. Usually though we would just sit down behind our pulka to have some protection from the elements, but as the days went on we generally did not bother with the tarp at all – I guess we were becoming more acclimatised as time went on, but also more focused on our goal and getting the tarp out was just seen as a bit of a waste of time (it was harder to get going again too after being under the tarp, even for a short period of time, and you kind of wanted to stay in the weather to keep your edge so to speak). 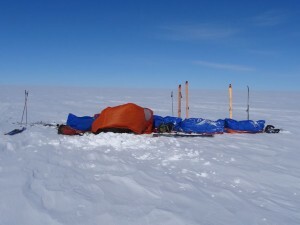 Each day we would down poles to make camp between 18:30 and 19:00. First task was to pitch the main tent (North Face Bastion IV) so our guide Robert could dig out the vestibule area and set up the stove to start boiling fresh water as soon as possible. Whilst this was happening the rest of us would pitch the second tent (North Face VE-25) a couple of meters downwind from the main one. This formation would allow us to capture both tents in the protective arc of a single snow wall at the front of the main tent on most occasions. One thing to point out on the second camp photo here is you can see how even a 'normal' windy conditions the snow wall can be worn down during the course of the night (wait till the pictures of the storm and the walls…). Once the tents were up there was usually just enough time to take your boots off (and for me remove the tape on my feet), get your kit sorted and have a quick bathroom break before the water was boiled and the call for dinner made. Dinner…. What can I say, you were pretty damn hungry by the end of the day and so looking forward to cracking open a vacuum sealed dinner pack (I didn't have a favourite, they were all pretty awesome), particularly since they would be piping hot from fresh boiled water, lobbing in blocks of butter, cheese, maybe salami, filling it with hot water and…..damn, I'm getting hungry just thinking about it, ha! 🙂 We would all usually have a good cup of cocoa as well and have a bit of banter before turning in for the night. For me I used two thirds cocoa powder and one third hot water. Oh yeah, it was TASTY – you ended up eating it more than drinking it, mmm…. FLASHBACKS: I remember one particular day, it was our first 40km session and we were all utterly destroyed. But just to make the day that little bit harder the ground was absolutely rock solid! 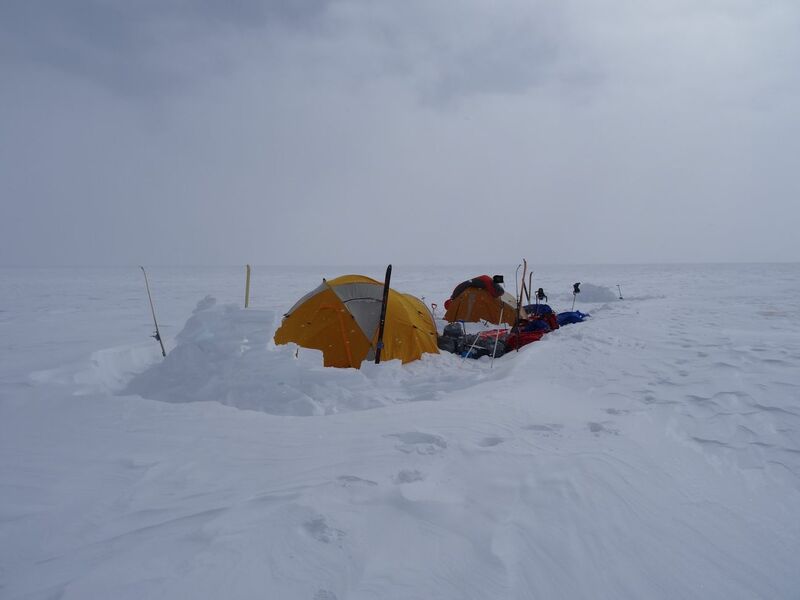 We basically had to get our ice picks out and dig down around 50cm in order to hit a softer surface to anchor the tents and all the guy lines. It took quite a bit of effort to do, and after such a massive day it was like rubbing salt in the wound. But again, what are you going to do? Just have to get on with it 🙂 and we did. By the time we had our fill, relaxed a little and shared some stories it would be anywhere between 21:00 and 22:00 – bed time. The temperature has dropped quite a lot by then, the grind of the day catches up with you and you just want to be in your sleeping bag to get nice and warm. If I was lucky I would only wake up a couple of times during the night, but you know what, despite the cold, despite the lack of sleep, despite the wind and everything else… you just get on with it. The next morning, wake up and do it all again 🙂 and again, and again, and again, and again…. That is the general overview of how our days were structured. Next week I will be going into some of the detail on camp life, and also touch on the question I always get asked: bathroom breaks! Couple new clips below for your viewing, and more to come in the next posting. If there are any topics by the way you want me to touc on or questions, write to me on the contacts page or ask me in the comments section below. Hope you are all well and your week off to a good start! 2. Expedition life – short video diary update during the crossing, featuring a special performance of the 'Greenland running man' by Eric the Red.